At 30 years of age, Urijah “California Kid” Faber has one of the most impressive records in MMA: 22 wins and 3 losses. His victories are split between knockouts and submissions, along with a few bouts that went to decision. He currently participates in the World Extreme Cagefighting (WEC) organization, but has also fought in Gladiator Challenge, King of the Cage, and TKO. Faber was crowned WEC featherweight champion at WEC 19 on March 17, 2006 and held the title for over two years until he was defeated by Mike Brown at WEC 36 on November 5, 2008. He successfully defended his title 6 times during his reign as WEC featherweight champion. Before his loss to Mike Brown, Faber was ranked as the #1 featherweight fighter in the world and is currently ranked #2 in the world. He is one of the most energetic, exciting MMA Fighters to watch. Urijah Faber was born on May 14, 1979, in the town of Isla Vista, California, and he was raised in Sacramento. Faber was born into a family that eschewed conventional living for an holistic approach. His mother gave birth to him at home and his father was adamantly against his receiving immunization shots. He considers his parents to be his heroes and his upbringing has had a significant influence on how he lives his life today. Faber avoids medicine and prescriptions, instead pursuing a healthy life solely through diet and exercise. His athletic accomplishments offer proof that his natural lifestyle works well for him. Active in sports since childhood, Urijah Faber excelled at wrestling, football, and roller hockey. After graduating from high school, he attended UC Davis, earning a degree in Human Development. He tried out for the wrestling team during his freshman year and his performance was rewarded with a full scholarship. By the time he graduated, Faber had become UC Davis’s all-time leader in team wins. In freestyle wrestling, Faber competed in the University Nationals where he was a national runner-up, becoming the true alternate for the University Nationals World Team. The school’s administration was so impressed that they asked him to stay on as the wrestling coach. Urijah Faber made his pro debut in MMA at the Gladiator Challenge promotion in November of 2003, where he choked out Jay Valencia at 1:22 of the first round. Faber went on to defeat George Adkins by TKO due to strikes on February 12, 2004, giving himself a shot at GC Bantamweight champion David Velasquez. Four months later, Faber defeated Velasquez by unanimous decision, and in doing so, became the new GC Bantamweight champion. Urijah Faber defeated Del Hawkins by TKO 3 minutes into the first round in his first of many title defenses. After this fight, Faber began to take fights in both GC and King of the Cage, GC’s parent promotion. Faber moved to the KOTC where he defeated Rami Boukai barely a month after his last fight. Urijah went on to steam roll Eben Kaneshiro by submission due to strikes to win the KOTC Bantamweight championship. 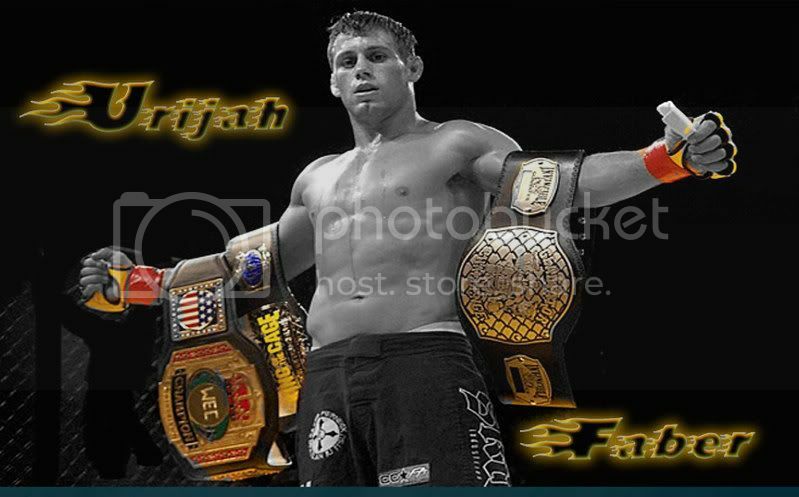 He was now champion of KOTC and the GC Bantamweight titles. Urijah returned to GC in March of 2005 and defeated David Granados by rear naked choke at 2:13 of round 1. After returning again to GC on September 10, 2005, Urijah Faber’s perfect record took a hit when lost his first fight and Bantamweight title to Tyson Griffin by TKO in round 3. Faber defended his KOTC title again in October of 2005 when he defeated Shawn Bias in the first round. In Jnauary, Faber went and fought at a TKO Major League MMA event going up against Ivan Menjivar. Faber won his fight by disqualification when Menjivar landed an illegal kick to a downed Faber. Urijah Faber made his WEC debut in March of 2006 when he was given a WEC featherweight title shot and defeated Cole Escovedo by TKO (corner stoppage) at the end of round 2 to win the WEC featherweight championship. On May 13, 2006, Faber put his KOTC Bantamweight title on the line for the third time and easily defeated Charlie Valencia by rear naked choke at 3:09 of the first round. Faber then went back to GC July 1 and beat Naoya Uematsu by TKO in round 2 to reclaim the GC Bantamweight championship. This gave the California Kid three title belts at once. On October 28, Faber defended his KOTC title for the fourth and last time when he beat up Bibiano Fernandes in round 1 by TKO. Faber later vacated his KOTC and GC titles upon signing a contract with the WEC in December 2006. Faber defended his WEC Featherweight title for the first time at WEC 25: McCullough vs. Cope on January 20, 2007. The California Kid beat Joe Pearson by submission due to strikes in the first round. At WEC 26 in March of 2007 he once again defended his title, defeating Dominic Cruz by guillotine choke at 1:38 of round 1. At WEC 28: WrekCage, Urijah Faber dominated Chance Farrar and submitted him by rear naked choke 3 minutes into the first round. The California Kid took a six month break between fights, the longest of his career after his WEC 28 win. He came back at WEC 31: Faber vs. Curran on December 12, 2007, and handled Jeff Curran on his way to his fourth WEC title defense. Jens Pulver, a fierce rival of Faber’s, was also on this card. In Jens’ WEC debut, he easily beat Cub Swanson in the first round, setting up a title match between Jens and Faber. Pulver and Faber exchanged comments in their postfight interviews, and the match was set for WEC 34: Faber vs. Pulver. At WEC 34, Faber and Pulver fought a constant back-and-forth battle, and the fight went the full five rounds, the first time in Faber’s WEC career that one of his fights had gone the distance. The judges scored the bout a unanimous decision for Faber. This fight also marked the first time Pulver had been defeated at that weight class. Next up for Faber was a fight Mike Brown at WEC 36 on September 10, 2008. However, the threat of Hurricane Ike forced this fight to be postponed and it was rescheduled for November 5, 2008. Faber suffered his second loss of his career when he was defeated due to strikes at 2:23 of the first round after being caught with a strong right from Brown. Jens Pulver got his chance to avenge his earlier loss to Faber on January 25, 2009 at WEC 38. Faber won this rematch by guillotine choke at 1:34 of the first round. After Faber handled Pulver quite easily, he called out WEC featherweight champion Mike Brown, who was in attendance, and announced he wanted a rematch for his title. In their rematch, Urijah Faber and Mike Brown went the distance at WEC 41 on June 7, 2009. Mike Brown won by a unanimous decision in front of his hometown crowd in Sacramento. Faber broke his right hand and later dislocated his left hand in the third round and managed to finish the fight despite losing both of his deadliest weapons. the California Kid had to resort to using primarily elbows and kicks starting in round 3. Immediately after the fight, Faber stated he wants another rematch against Brown. Faber will fight Josh Grispi next in order to set up the much anticipated rematch, but that wont happen until Faber gets medical clearance to fight again after undergoing surgery to repair his broken right hand. During his MMA career, Faber has earned several titles, including the WEC World Featherweight, KOTC Bantamweight, and the GC Bantamweight championships. He claims that his success in the cage doesn’t come from relying upon certain fighting techniques or moves. Instead, he favors an approach that adapts to the dynamic of the moment, allowing him to respond to other fighters’ styles. Even though Faber has fought in professional MMA bouts since 2003, he has yet to participate in the UFC. This may be due to his receiving better opportunities in his weight class within the WEC. But, wherever he fights, Faber’s quick hands, dominating submissions, and formidable takedown skills promise to add additional victories to his record.